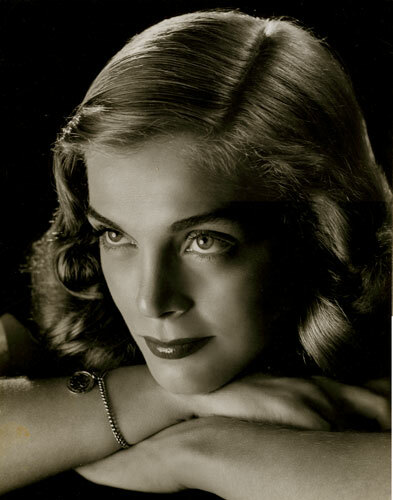 Lizbeth Scott was born Emma Matzo on September 29, 1922 in Scranton, Pennsylvania, the oldest of six children of Mary (Pennock) and John Matzo, who were Slovak immigrants. Scott attended Marywood Seminary and the Alvienne School of the Theatre in New York City, where she adopted the stage name of "Elizabeth Scott." After doing a national tour of Hellzapoppin, she was discovered by Broadway producer Michael Myerberg in 1942. Scott was the understudy for Tallulah Bankhead in the original Broadway production of "The Skin of Our Teeth." Later in 1943, a Warner Brothers producer, Hal B. Wallis, discovered Scott at her 21st birthday party held at the Stork Club in New York. Wallis scheduled an interview with Scott the following day, but Scott canceled it when a telegram asked her to replace Miriam Hopkins at the Boston production of The Skin of Our Teeth. 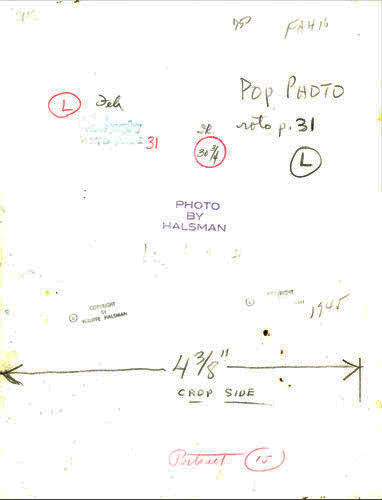 Original silver print 14 x 1 with Halsman's stamp on the reverse. Dated 1945.